Before the good intentions for the new year (if you already worked-up the old ones) there is the wish, to photograph the firework as good as possible. With a little bit of preparation and knowledge this will work. About these things more below, first "How to optimally photograph the fireworks"
The camera settings are relatively easy. What we want is an exposure time of 10 to 30 seconds. Why? In this timelaps will be (hopefully) plenty of firework rockets going up and the sky will never be empty. In advance, as soon as you find a good position, take some test shots with your settings to see if and when your view is well-lit (This should be by all means lateron be seen on the photos and not be overexposed). Your settings depend on your surroundings and differs from town to town and village to village. 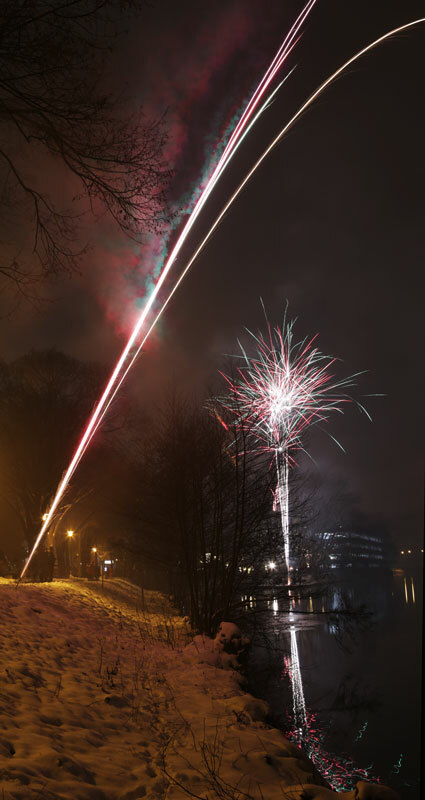 The shown images of the Tübinger fireworks were taken with an exposure time of 15 seconds. In larger city and metropolis is more "light pollution" - there the exposure time can be shorter, while in the country sight or in villages it is longer (it can be practical, as fewer rockets start at the same time). So, test in advance what the optimal exposure time for your location is. Such long exposure times only function with a tripod! As few as possible, to avoid unnecessary image noise. In other words: if your camera can be set to ISO 100 use it (some cameras start at ISO 200 - so in that case use it). Photographing fireworks is an area of photography where all values interact well. We want a high depth of field and we want a long exposure time. Therefore, we need an aperture value of 8 or higher. As a remembrance: the smaller the opening (high f-number/ aperture value) the fewer light can fall onto the image sensor inside your camera - the exposure times and the depth of field increase. Unwanted side-effect of high f-numbers: we receive through the light refraction at the lamellas of the aperture when photographing bright lights, a starbursts effect, also called sun stars, sun flare or star effects. Therefore, keep an eye open for that and don't exaggerate the f-number. F-number 64 might not be the perfect choice. Also the spot of sharpness is in general set ahead. Due to the big depth of field it is no problem. If we do not switch the section we want to photograph we can easily adjust the sharpness beforehand and set the camera on manuel focus. We do not have the time to let the camera determine the sharpness in AF (what anyway mostly does not work in the darkness). The sharpness is set in the ratio 1/3 to 2/3 (as described in the chapter depth of field and landscape photography). In the example photo the sharpness was set onto the lights of the Neckarbrücke (the bridge) (perfect for setting the focus onto) Everything important in front (reflections in the water) and in the back, is also still sharp. Therefore also the fireworks above. Here mostly something in the direction around 50mm (of a full-frame sensor) or less helps. We need a lot of sky and few close-ups. Hence take an objective with you which is between 24 and 70 mm. Now it is all about one point, which needs experience. Normally it is unknown, where the most rockets will explode. And these rockets reach different heights. So, better add some height then lateron moaning about the most beautiful round fireball, which was unfortunately cut on top because of the choice of the section. On New Year's Eve there are fortunately always people, who can't read a clock, but can handle a lighter, who fire rockets far before midnight. That way we have a reference height - that's why we should arrive timely to set up everything. When you want to photograph a professional firework you can only ask in advance. The pleasant thing about within-focussing objectives is that they keep the same focus point, when you change the section! Simply try, when you have one of those. You can recognize if you have an within-focussing objective, if it does not change its length when you zoom. Make a lot of photos! And now I can only further say: make a lot of photos and have a lot of luck to catch the most beautiful explosions happen exactly in your chosen section. Depending on the country you have half an hour or - for example China - much more. Professional trick for firework photos: long time exposure is the key - i.e. the setting "Bulb". And to controll it the lens is covered in a pause (nobody it is starting a rocket) with a black foam rubber plate or a black hat. Now you need to count the seconds when the lens is open! The in the beginning identified time period should be adhered to. Please test the function long time exposure ahead with your camera - as it should not be tested on your first time to photograph firework in darkness, you should already know how your camera reacts and what it needs. A tripod is vital - and please do not pick one that falls over when you look at it. The tripod must be stable even when you operate the camera. Good tripods have a hook on the rod below, which you can pull out and hang a weight on it. That way the tripod is even more stable! The closest choice for a weight is your photo backpack, which has the additional benefit that it isn't standing in the wet or unobserved anymore. „Location, location, location“, as Achmed from Jeff Dunham says (Take a look on youtube to see it). The location determines if the firework photography is extraordinary or boring. Perfect is a location, which others are able to recognize lateron in the picture. So best choose known, distinctive or famous buildings of a town for the picture. In the example picture we can see the collegiate church of Tübingen (relativly bad, because of misty weather) and the Eberhardsbridge - people from Tübingen will know, that the photo was taken in Tübingen. Perfect is a body of water infront of you. 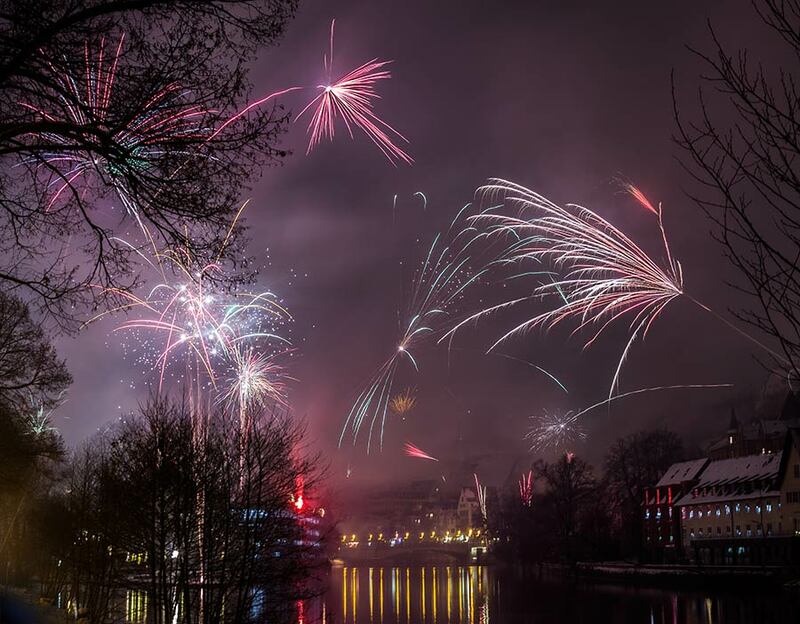 This has 2 effects: We double the firework because of its reflection in the water and we do not have people infront of us (standing in a river is in general too wet for most people), which could ruin the picture, when they start lighting up crackers or unleash a table fireworks display. That are the reason why you should avoid groups of people. We want to take a picture of the fireworks illuminating the sky and not of the illuminated dirty snow infront of us. Firework infront of you "kills" the firework in the background (sky). And now have fun photographing firework.